1.) A working phone, with a working camera, and therefore Instagram. Leave no meal un-photographed! 2.) A Kitchen Aid standing mixer. I was almost in *tears* opening it, both because I was so thrilled to receive the mixer and because I never thought I’d reach a point in life where I’d get teary over a standing mixer. 3.) A Martha Stewart cupcake holder/transporter, which was a wedding gift from one of Mr. Chef Juje’s single guy friends. There’s something about a 20-something guy going onto a registry and buying something so domestic that I just find absolutely sweet. 4.) drumroll…..The discovery that there is an entire world of people out there making COCKTAIL CUPCAKES. Seriously. Google it. 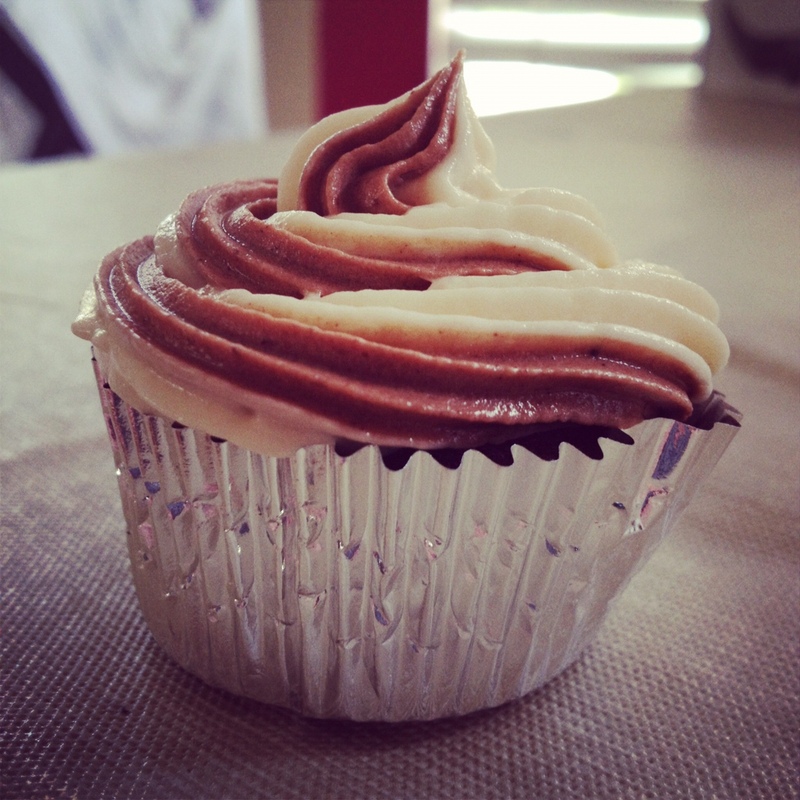 The result – mudslide cupcakes!! I made them for a 4th of July party yesterday. True, there’s no red, white or blue, but all the cutesy cakes-shaped-like-a-flag desserts would have really been lost on the crowd we were with. Booze, though, definitely was NOT lost on them. Alas. The key to a crowd-pleaser is to know your audience. The recipe came from The Curvy Carrot (awesome name, by the way) and she does a phenomenal job of explaining all the steps. The best part was her explanation of the swirls — simply take two pastry bags, one with each type of frosting, then insert into a third pastry bag fitted with a tip. 1.) This is a messy, messy, messy endeavor. 2.) I made mini cupcakes and they were gobbled up. Mini things are easier to grab and eat. 3.) These are an indoor treat. The icing gets a little melty. 4.) These are not before-work treats. They’re not cupcake shots by any means, but the Baileys and Kahlua icings are a little punchy. This also makes the cooking/taste-testing process VERY INTERESTING.